Today I'm sharing some cards made using the Accented Bloom stamp set in the new Annual Catalogue. This is such a versatile stamp set and is a great set that will allow you to make quick and easy cards. First a card that features Grapefruit Grove and Gray Granite - both new colours in the catalogue. This card can be made in any colour and will be just as beautiful. Check out the Faceted Dots that add just a little bit of extra bling. It's hard to see in the picture, but Shimmery White cardstock was used. Now for a card that shows off this stamp set with white embossed images. Isn't this so pretty! Don't you love the Polka Dot Tulle ribbon! Interested in placing an order? You can go to my ONLINE store and use the Host Code WB2JQEUM to place your order. 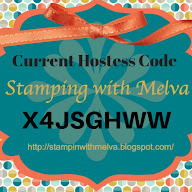 Use this host code when ordering and receive a free gift from me! I'll send you a set of 4 cards as a Thank You gift so you can make at home. If your order is over $200, please do not use this code, but you’ll still get the free gift.